Five weeks ago I joined AND Digital as a Product Analyst with three years’ of technology consulting experience. Fast-forward to today (time really does fly!) and I’ve officially completed ANDbootcamp alongside 14 other new joiners, who are now collectively known as ‘Canyon Squad and Groupies’ – Hooah! Soon, a new start group will be joining the company and will embark on their own bootcamp experience. By then, I will have been introduced to someone from this group as a buddy, responsible for helping them through the onboarding process alongside our Ground Ops team. Knowing who people are at AND Digital and having an understanding of where they are positioned within the business will help you to build the bigger picture of how everyone is interconnected at the company. Take the opportunity to ask others about what keeps them busy day-to-day and what interests them particularly about their role. As well as asking others about what they do at the office, be sure to ask people about what makes them happy outside of work. Asking someone about their personal ANDtitle is a great place to begin on day 1, when you don’t know your other colleagues that well. Don’t focus only on the here and now. Also ask people to share what they were up to before starting at AND Digital, this can be incredibly inspiring to listen to. As much as ANDbootcamp is about understanding what your peers’ backgrounds are, it’s as important to share your own stories. Let others know where you’ve come from, what you’ve learnt from your previous experiences and what you hope to learn and apply going forward. This will help people to understand what motivates you and to identify where they may be able to help you on your journey. Plenty of opportunities to share your experiences and insights will be presented throughout the 5 week bootcamp programme. You will find out that those working with you come from all walks of life. Add your story to the mix and help to fuel the diversity of the team, which ultimately makes AND Digital such a great company to work for. With a wide range of personal backgrounds and differing levels of work experience across the organisation, the views that people have on particular subjects won’t always be the same. You should take every opportunity to debate with others around common areas that will be brought up in discussion throughout your AND Digital career. Keep your debates focused and to-the-point. Work towards agreeing on a shared view for the chosen topic and align to this across the group. It is more than likely that views will change given time, so be prepared to re-open challenging areas for discussion. Feedback will be provided to you throughout your bootcamp experience, this will usually come from your Squad Lead and the Ground Ops team members who are managing your training. This is just to give you an idea of how you’re getting on and will help you to build out your personal development plan in the final week of the programme. Naturally, the formal feedback sessions are limited. Outside of the sessions that have been set up for you, find the time to ask other colleagues for their thoughts on your performance. Peer-to-peer feedback is as powerful as the stuff that your manager will have to say to you. You will be asked to provide regular feedback to the AND Digital Ground Ops team on your experience at bootcamp. Use this time to provide your thoughts on the training experience. A balanced approach is the key to providing constructive feedback – share your positive observations and also your suggestions on potential areas for improvement. A detailed overview of how these tools are used at AND Digital will be provided to you throughout bootcamp – so don’t worry at all if you’re not a master of these before you turn up on your first day. It is common for our clients to join you for certain parts of the ANDbootcamp experience. As examples, they may want to learn all about the latest digital trends or know how to become a certified Scrum Master. Take every opportunity to introduce yourself to the clients that are with you at bootcamp. It’s a great way to introduce yourself to the people we work with and it’s also the only way to hear first-hand about what the client is developing currently before you make your way on to client site. There are a number of organised social events that take place throughout the 5 weeks of ANDbootcamp. Details and dates for these will be communicated to you ahead of your first day. 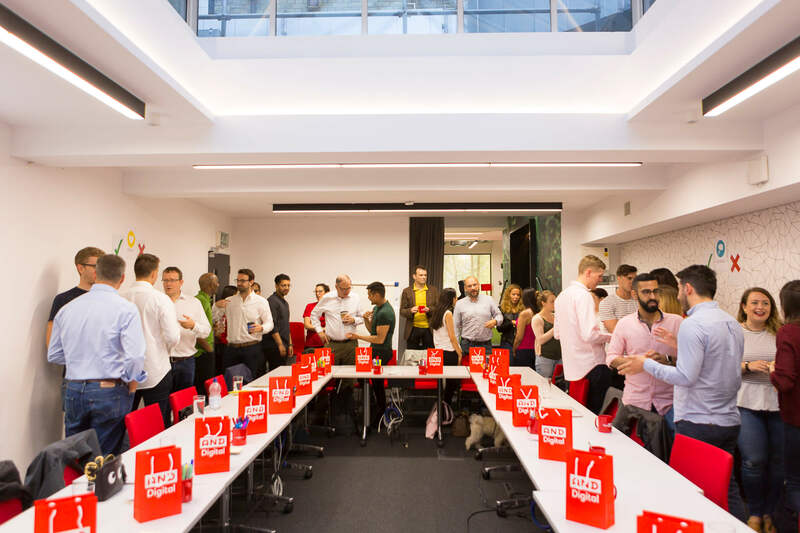 These range from dinner and drinks to hands-on team building exercises, which take place all around London. Socials are the perfect way to get to know your colleagues in a more informal environment, outside of the facilitated seminars and simulations that form the bulk of your training experience. ANDbootcamp is a safe learning environment designed to prepare you for working with AND Digital’s clients. This is your opportunity to pick up new skills, identify areas that you would like to develop and have fun experimenting with ways of working as a team. Choose something you would like to know about by the end of the training that you haven’t explored fully before. Practice the skill with those in your squad who are more experienced, test what you’ve learnt by yourself and refine your application of the learning. You will come out of bootcamp with new skills and a clearer idea of what you want to develop personally once on client site. In summary, approaching ANDbootcamp with a positive attitude, open mind and a willingness to share will put you in a really strong position to get the most out of your training and the time that follows this for you at AND Digital! Best of luck and enjoy!